Last week was so much fun! 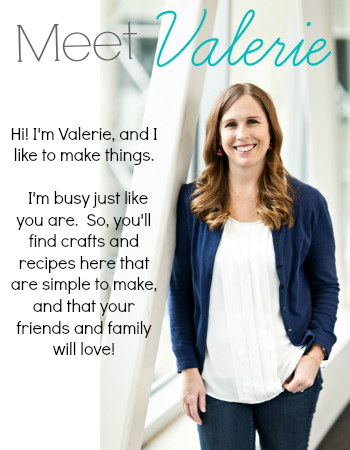 My sister (and co-author!) Laura finally moved back to the States from their army assignment in South Korea. They had some down time before her husband starts his next assignment, so they came on a big family tour that included a stop here in Phoenix! The five cousins had a blast playing together, and Laura and I decided we absolutely had to craft something while we were together. After much deliberation, we decided to recreate the wreath we saw here. We made sure to take pictures along the way so you can make one too. Estimated time- Several hours. Maybe more. **Note** It helps a lot if you have a craft cutter such as a Silhouette to save you some time, but you certainly could just trace and cut a bunch of circles. Here we go! 1. You need a large pile of semi-circles. 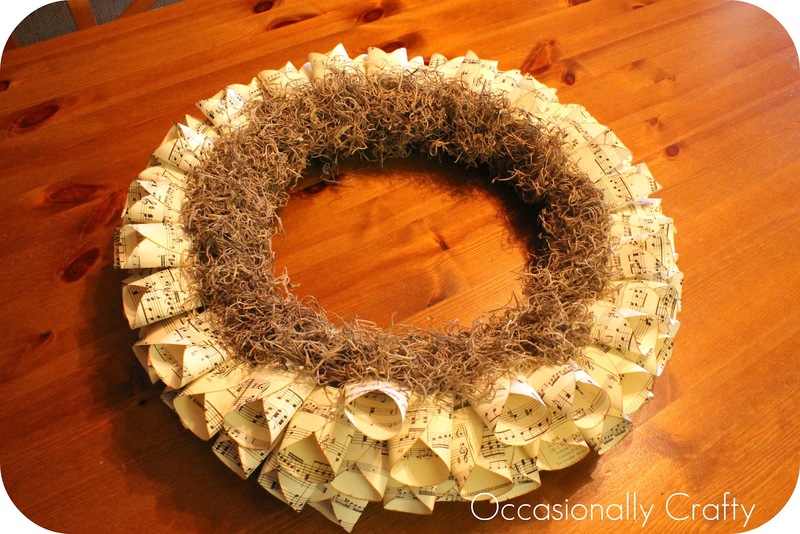 I don't even know how many we used per wreath- maybe 100? We cut ours on the Silhouette Cameo. We made a 4.5 inch circle, then inserted a cut line across the center. This gave us two semi-circles. 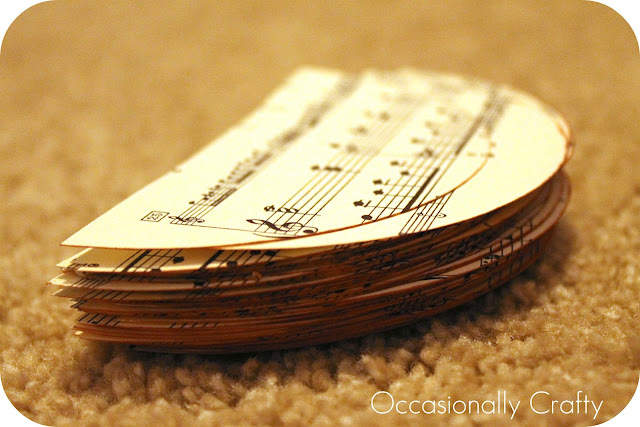 My sheet music was slightly larger than a piece of paper, and I could get three of these cut circles per page, or six semi-circles. 2. Ink the curved edge of each semi-circle. Make sure you can see ink from both the front and back. 3. Create your petals as follows. First fold over the left side of your semi-circle to the middle. 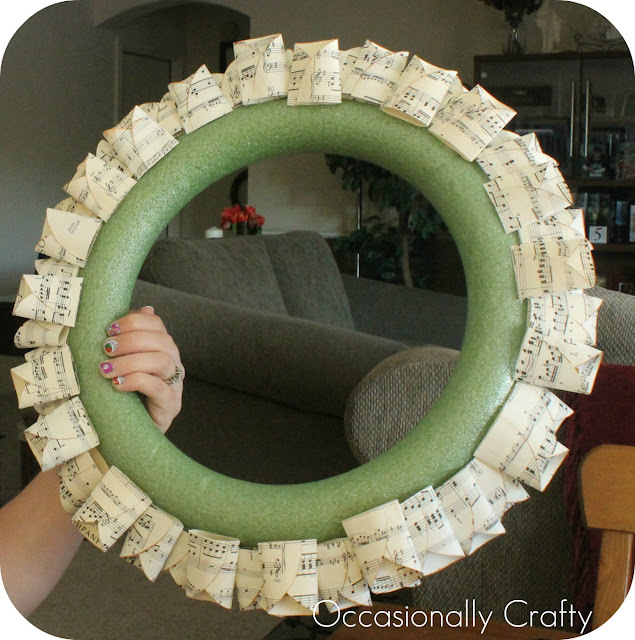 Put some glue on the front of that side, then fold the right side of the semi-circle on top of the left and press together. 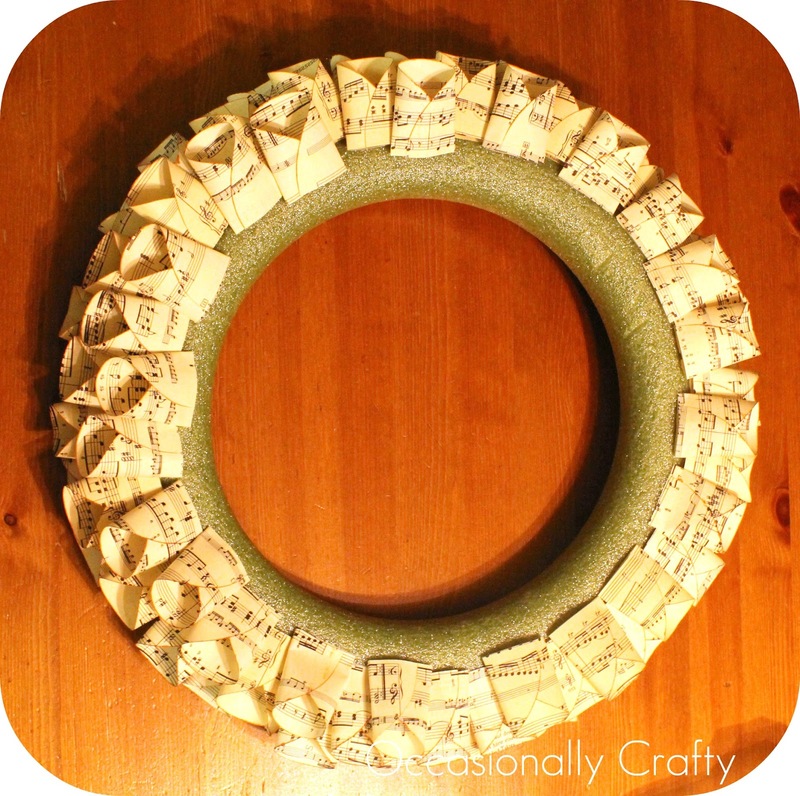 Pinch the bottom together, run a thin line of hot glue along the bottom back, then press it to your wreath form. 4. 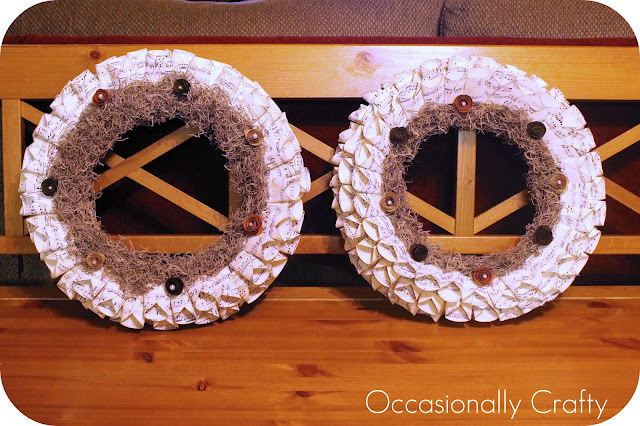 Add petals all around the wreath. I slightly overlapped mine as I added each petal. 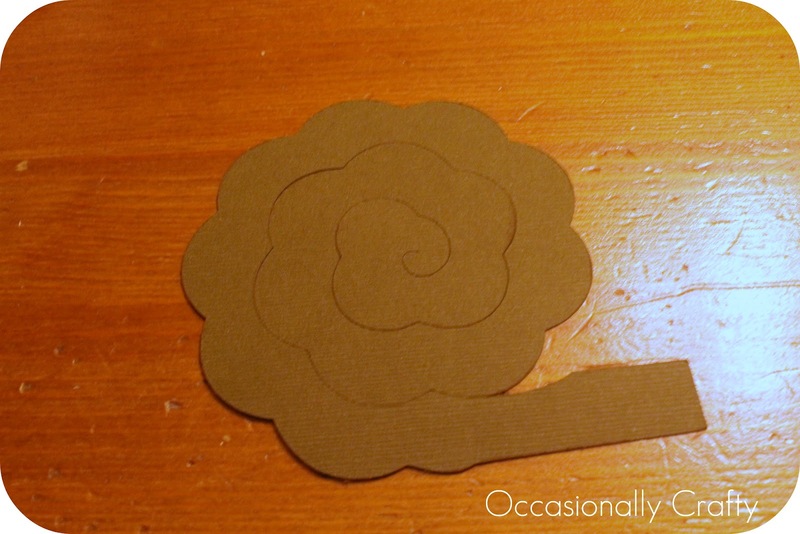 Continue adding petals until you have three rows of petals. Here's Laura's after two rows. And here it is with all the petals finished. 5. Glue spanish moss over any visible part of your wreath form, making sure to slightly cover the bottom edge or your petals. The easiest way to do this is just slather a whole bunch of hot glue on the wreath form, then press a wad of spanish moss onto the glue. Repeat until you can't see any of your wreath form. It looks ugly and messy and you'll be worried about screwing it up. Just keep going. It will look great in the end! Trim up any unsightly pieces of moss, and it should look like this. and roll from the outside in (starting at that little tail). 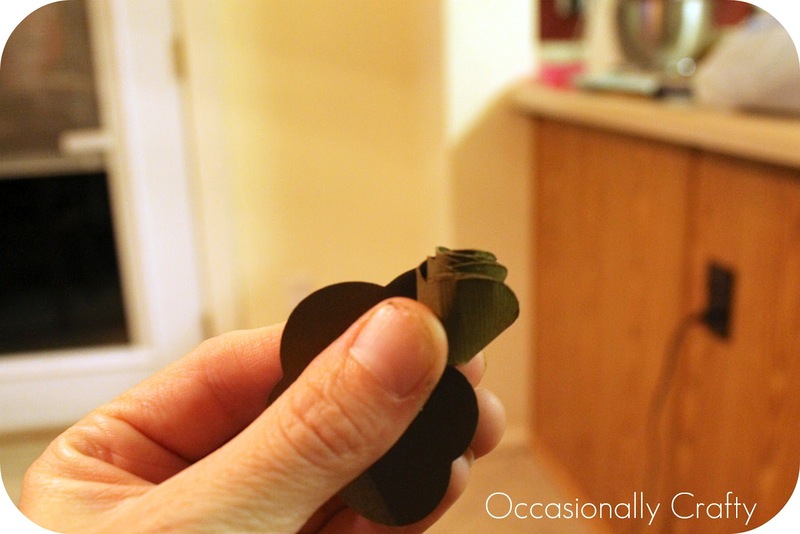 Keep it tight, then let your roll spread out a little as you glue it on to the base. We chose fall colors for the upcoming fall season. Add pearls or pearl beads to the center of your flowers as desired. 7. 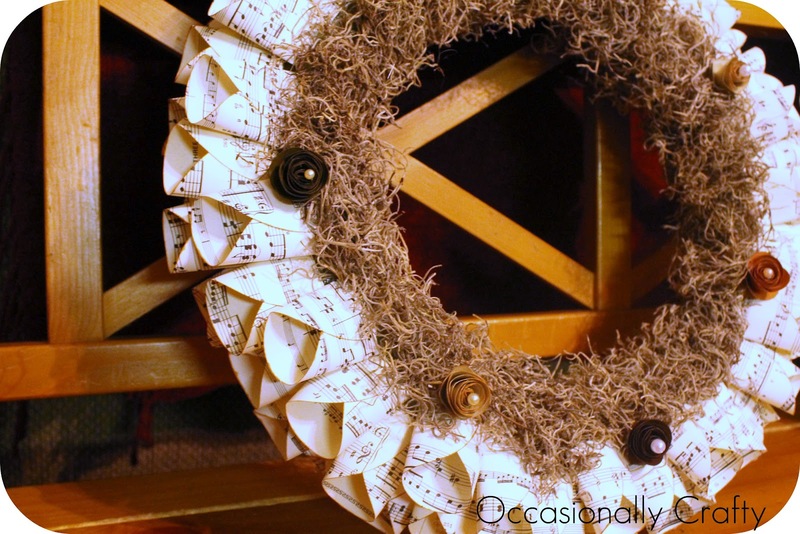 To hang, simply hot glue or staple a ribbon loop to the back of your wreath form (not pictured). Here are both of ours, side to side. Isn't it funny that we did the exact same project and came up with slightly different results? 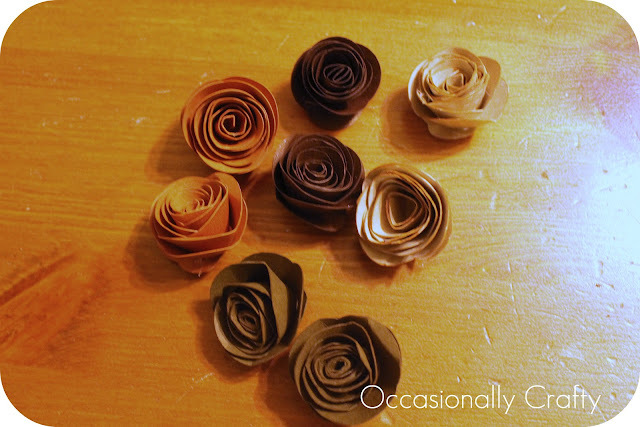 Laura's petals lie a little more flat, and mine are a little more rounded and front-facing. She ended up with more wreath to cover, hence more moss. I love them both! 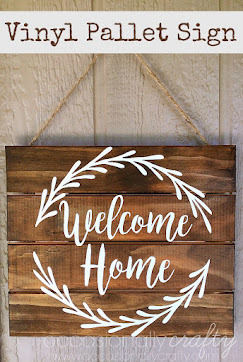 I can't wait to hang mine up along with my other fall decor! Laura's off to visit more family around the great Southwest. She's weeks away from getting her craft supplies out of storage, so you might not hear much from her in the next few weeks. It sure was a lot of fun crafting with my sister in real life! This is a great project. Really love it. Great directions too. Love this!!! the moss with the sheet music is beautiful!!! I knew there was some reason I've been moving with boxes full of sheet music all over the United States. LOL! Not all of the sheet music even mine but the owners are not interested in it. This will be a great way to use that sheet music. I'm thinking of adding ornaments to mine to make a Christmas wreath. Glad you had time to craft with your sister. 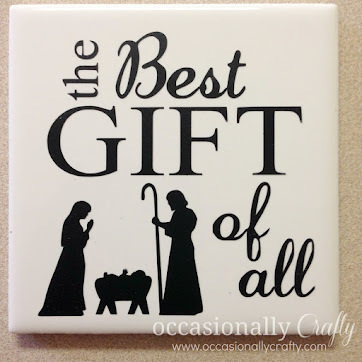 I'm hoping to get together with mine next month to craft with. Wish she lived closer. Thanks ladies! Myoriah, ornaments would be really cute! 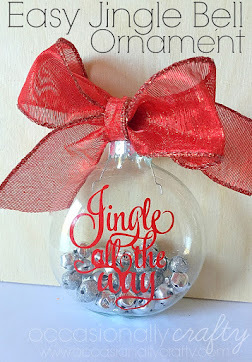 Those mini ones from the dollar store or Target would be perfect! If you do it, we'd love to see the finished product! 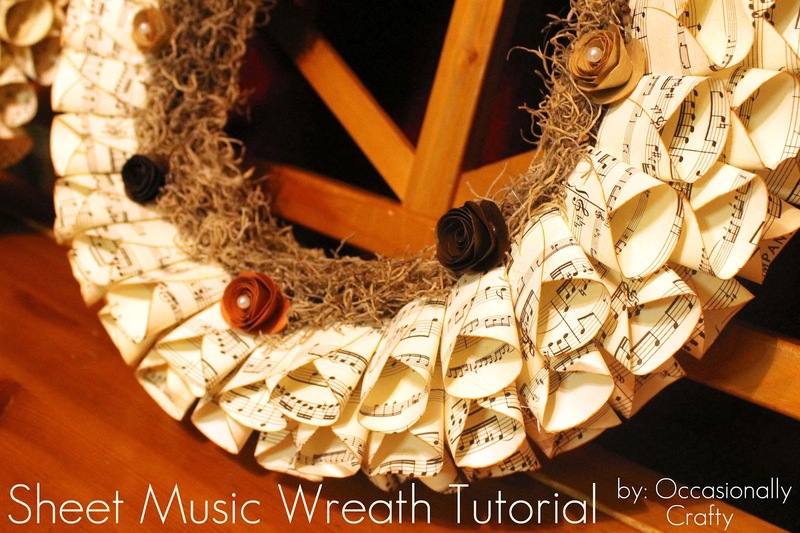 Love your version of using sheet music/book paper to make a wreath. 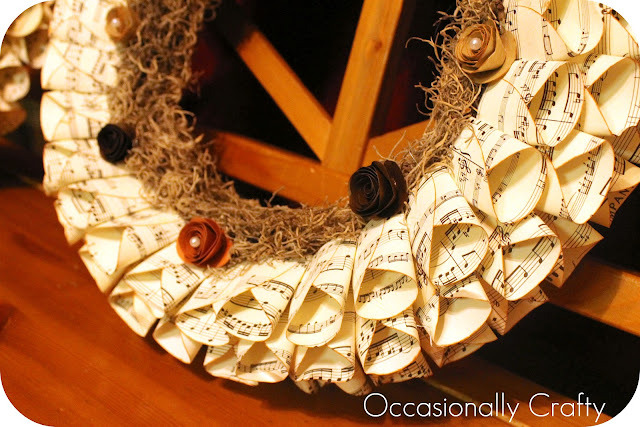 I made a wreath using book pages and it made a huge wreath. 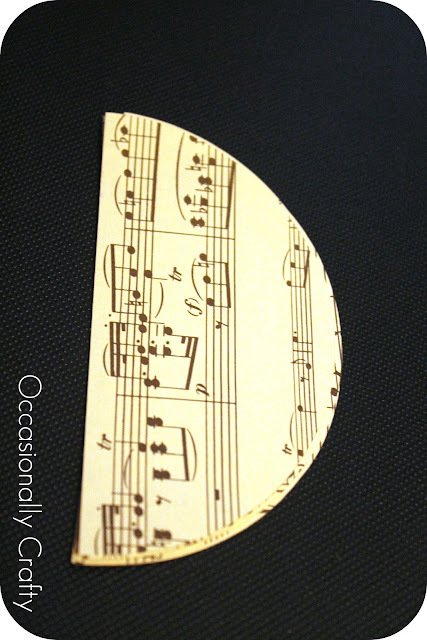 What settings did you use on your Sil to cut the sheet music? Thank you so much for this post. I want to let you know that I posted a link to your blog in Creative Busy Bee Craft Inspirations, under the Page 6 post on Aug. 20, 2012. Thanks again.